5-in compressed rawhide sticks (5) and 4-in bones (5): Durable, safe dog chew made from tight layers of compressed rawhide that won't expand when wet making our rawhide rolls and bones fully digestible. Treat your dog to a chew that lasts! Standard Bully Sticks (5): Nothing satisfies a dog's instinctive urge to chew like an all-natural bully stick made from grass fed, free range cows. ⭐ MAKES THE PERFECT DOG BIRTHDAY GIFT: Five different mouth watering chews and treats for small dogs! 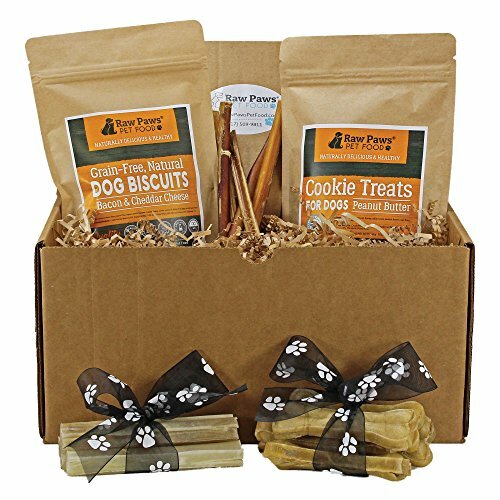 ⭐ THIS GIFT BOX FOR DOGS INCLUDES: Compressed Rawhide Sticks & Bones, Standard Bully Sticks, Grain-free Dog Biscuits & Peanut Butter Cookies for Dogs. ⭐ ALL-NATURAL CHEWS & TREATS: Any dog will love this wholesome variety! ⭐ DELICIOUS & NATURAL: 100% digestible and free from artificial anything! ⭐ 100% SATISFACTION: Full Refund Guarantee - no questions asked! Publisher: Raw Paws Pet, Inc. Studio: Raw Paws Pet, Inc. If you have any questions about this product by Raw Paws, contact us by completing and submitting the form below. If you are looking for a specif part number, please include it with your message.